The extremely hot weather all around Europe right now is making it difficult for tourists as well as the inhabitants themselves and I’m not talking about keeping the Champagne cool. With temperatures even a bit over 40C, there are several warnings to listen to and take serious. People (or you yourself) might die if you don’t. In our favorite winter escape country Spain, it’s a heat wave coming with extremely hot winds from Sahara in the South, but even the islands out in the Atlantic ocean or in the north of Spain has a horrible heat wave. When looking at my weather app the latest month or so, Costa del Sol in Spain have had at least 10C degrees more than Rio de Janeiro in Brazil! Look for hotels here: Copthorne airport hotel Dubai, piet hein hotel amsterdam. Even places in European countries which are not really known to have the hottest weather (like Scandinavia and UK) are also gonna have a hot week with higher temperatures than normally accoarding to the weather forecasts. The heat make it risky not only to get a heat stroke and especially for already ill or old persons, but also the danger of fire breakouts. Many tourists are not taking it seriously and take precautions to avoid start of fires: not cautious enough when BBQ’ing or with their cigarettes thrown in the extremely dry nature. Never, ever throw your cigarettes in the nature! Always put out your cigarettes in some water to be 100% sure they are put out. Never BBQ in the nature during heatwaves! At other times, always have water with you (or use sand) to suppress the fire. Make sure an extra time that it’s really put out. You don’t wanna be the cause of people losing their homes, do you? Never ever leave either your kids or your pets in the car alone during a hot day, not even for a few minutes. If they already are dehydrated or on the way to get a heat stroke, minutes can be enough to be dangerous. If they look like they are not really feeling OK: get cold water to them FAST! Shower them with it as well as let them drink a lot of the water. Read my tips on How to keep your dog cool while traveling. I have noticed before that people are generally not thinking of the risks with the heatwave – probably persons that is not so very used to heatwaves. Locals tend to know what to do, so if you happen to be a tourist in a heatwave: ask the locals what they do to cool down. Use sunscreen – don’t forget to apply several times during day! Make sure you never fall asleep in the sun! Another maybe not so wellknown precations for tourists (from colder countries) which the locals know well, is to put wet towels in the fridge to get cold and put them over your body to cool down – repeat as neeeded. Also if you have place for it in your freezer, you could put a plastic bag with your bed sheets in the freeze for a couple of hours before bedtime to easier be able to fall asleep. (You always need a good night sleep to cope well the day after). I always pack ready fluid replacement bought from the pharmacy with me when traveling, which can come in handy not only when you lost fluid because of heat, but also after vomiting or stomach diseases. If you have not packed it, you can make it yourself as below. Drink it in small portions but often. The fluid replacement can be stored maximum 24 hours in the fridge. Don’t give it to children, they might not be able to handle that much salt, buy ready fluid replacement in the pharmacy for them. The most obvious sign of dehydration is that they don’t pee anything or having a darker pee than normally, but there are many other signs where headache is a common one that I myself always get. Do you have any other tips to cool down or avoid being dehydrated? Please leave them in the comment or leave a link to the information. WE LOVE YOU IF YOU LEAVE A COMMENT! Traveling with your dog, especially to a hot country, put some demands on you as the dog’s owner. There are certain very important things to know and keep in mind if you care for your dog. 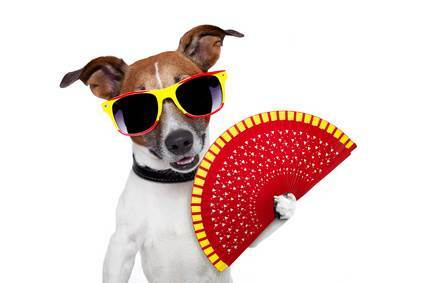 This post tells how to keep your dog cool – maybe cool sunglasses and a Spanish fan not is the best…? The most obvious sign that your dog think it’s too hot is that the tongue hangs out of it’s mouth. Why does a dog hangs his tongue out of the mouth? He tries to regulate his body heat. The moisture on the tongue will make the blood flow to be cooler. I can’t say this enough strongly: never ever leave your dog in the car alone during a hot day, not even for a few minutes! It’s very painful for them. 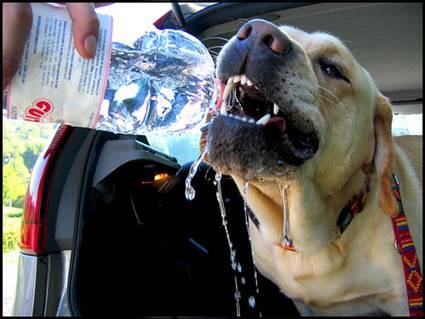 Dogs do not cope with heat very well, in fact much worse than we do ourselves! If traveling by car: try to travel when it’s not too hot and keep the AC running all the time. Do stops regularly along the way and if you can find any places where the dog can take a bath along the way, make the stops there. Have enough towels in the car to last for the whole trip. A bath will cool down the dog for a long time. If leaving your dog at your holiday rental while you’re going out: make sure that it’s not too hot and that there is enough air. Do leave the airconditioner on for the dog and if it use to be power outage in the area: leave some windows open to be sure the dog get some air. Always exercise your dog when it’s least hot, which means in the early mornings and late evenings. Try to let them use their heads instead of their bodies. The brain needs the most exercise for them to get calm and satisfied. Try to avoid asphalt roads since they absorb heat trough their feet. That’s also why the best way to cool down an already too hot dog is to place the dogs feet in cool water and sprinkling the chest with cold water or cover him in wet cold towels – plus letting him drink cool water of course. Also remember that a dark coated dog will be faster dehydrated than a light coated dog. Have a piece of an old bed sheet with you that you can wrap around yuor dog, wet it with cool water and place it on his body. Sometimes it’s also enough when the dog lays upon it. Keep it wet. It’s a great cheap way to keep your dog cool, the bed sheet don’t take up much space/weight and you will need to have water with you anyway. Also give your dog some dog treat that have been in the freezer or if not possible when out: give the dog an icecream, which will cool him down a lot – at least so that he stop panting for a while, but that will only help temporarily. The sugar in the icecream will make him thirsty eventually – and maybe add up his weight if you have a overweight dog. Use your fantasy: set up a childrens pool, put on the sprinklers. Don’t be mad of the dog if it has been digging itself a hole in your garden and laid down there – it’s a way to find a cooling place. How do you know if your dog is dehydrated? Look out for the signs: unusual panting and drooling, lethargic, fever, vomiting, bloodshoot eyes and paleness among others. If you lift the skin: will it fall back fast again or not? If not, the dog is probably dehydrated. Don’t put ice on the dog – visit the Vet to be sure that your dog will be OK! Landing in São Paulo recently, I was stunned by the intensity of the applause that rumbled through the plane’s cabin upon touching down at Guarulhos International Airport. It’s a curious thing, that seemingly spontaneous ovation that often accompanies an aircraft’s safe return to terra firma. I call it the Landing Clap, a common yet enigmatic phenomenon of modern air travel. The Landing Clap doesn’t follow every touchdown. In fact, with extremely few exceptions, it is rarely heard on domestic routes at all. The precious few times I have witnessed the Landing Clap on internal flights, it was at the end of a journey plagued by seriously heavy turbulence or obvious mechanical difficulties. This leads me to conclude that, first and foremost, the Landing Clap is a joyful sigh of relief, a cathartic public celebration at the conclusion of a particularly disquieting flight. Above and beyond the fear factor, however, the Landing Clap is a peculiar expression of love for one’s home and country. I have noticed that the salvo is always heartiest on national airlines and, with few exceptions, the applauders are always returning to their native soil. Spaniards on Iberia Air Lines who sit on their hands when the plane lands at New York’s John F. Kennedy International Airport will clap heartily when arriving at Madrid’s Barajas. Scattered applause always means that a majority of a plane’s passengers are on an outbound flight. Hundreds of hours of subjective study have also proved that the length of any given flight is directly proportional to the heartiness of the applause. For example, the Landing Clap at the termination of a journey from London to Hong Kong (13 hours) is distinctly heartier than, say, on a flight from New York to Prague (8 hours). Furthermore, the relative enthusiasm of any given Landing Clap is commensurate with the “cultural passion” of the clappers. Extroverts like the Spanish — or in my recent case, the Brazilians — clap with far more zeal than the relatively restrained English or Argentines. But no culture is immune from participating in this curious ritual. Jordanians, Indians, Kenyans — I have heard ovations from them all. Even the famously unemotional Japanese engage in the Landing Clap. The heartiest clap? That distinction goes to El Al passengers from New York touching down at Israel’s Ben Gurion International Airport. Because the plane is often filled with Brooklynites, this is one of the rare occasions where the majority of passengers applaud at the end of an outbound flight. As for myself, I must admit to having literally kissed the ground when returning from particularly wretched places, but I have never participated in the Landing Clap. To me the display suggests a lack of sophistication that only serves to identify the infrequent flyers on board. More importantly, the Landing Clap has a displeasing nationalistic sound, as unpleasant as Olympic medal counts and just a notch above soccer hooliganism. Passionate applause is de rigueur when planeloads of Russians, Germans, Italians and others from flag-waving cultures return safely to their motherland. Never mind that, statistically, it’s far more risky to drive a car — and landing actually signifies that the most dangerous part of the journey is about to begin. Author Bio: Daniel Levine is a trends expert, keynote speaker and former writer of a dozen Frommer’s travel guidebooks. He is currently the Director of The Avant-Guide Institute, a global trends consultancy based in New York City. A mix of other travel resources we prefer or have some kind of connection with. from Best At Barbados Holidays!